(1) The Underlying Cause - The 2008 financial crisis started when the five year (2002 - 2007) housing bubble popped in late 2007. When the bubble in the US real estate popped, it triggered the explosion of an enormously bigger bubble in the high yield debt which had been created on top of the housing bubble. In a way, the correction in the US housing market was the little explosion that detonated the mortgaged-backed high yield financial nuclear bomb. Similarly, from 2009 to early 2015, a new high yield debt device was created, then aggressively marketed and sold. This new high yield debt was constructed this time on top of the bubble in the oil and fossil fuel industry. Now that the bubble in oil and energy has popped, markets around the world are waiting to see if that little blow up is going to detonate another financial nuclear bomb. 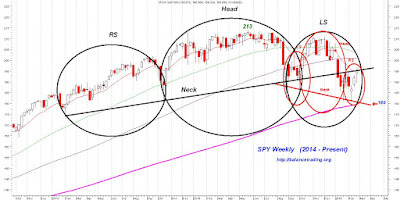 (2) SPY Chart Patterns - In 2007 a large Head and Shoulders Top (H&S Top) price pattern was formed in SPY weekly chart, as shown in black in the chart below. The Right Shoulder (RS) of that H&S Top pattern was made up by yet a smaller H&S Top price pattern (shown in red). 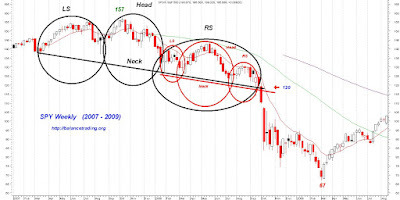 When SPY finally broke through both necklines of those H&S Tops (SPY 120), it continued its sell off until March 2009, when the Fed intervened with its QE and stopped the financial meltdown. 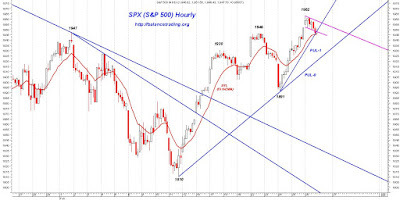 In the current SPY price chart, shown below, a similarly large H&S Top price pattern (shown in black) has been formed. The RS of that price pattern is being formed now. 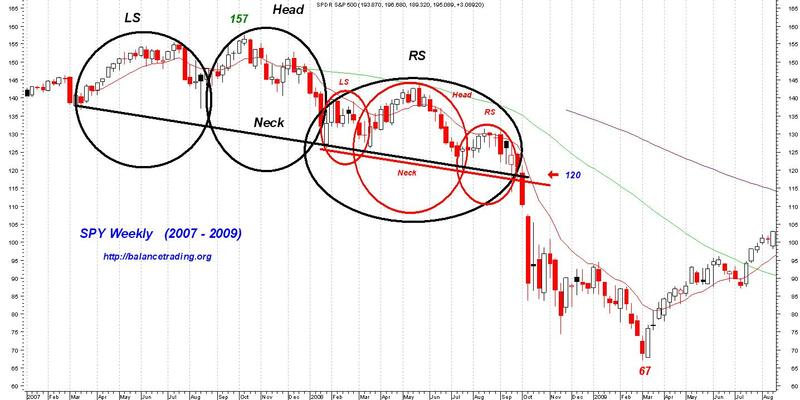 Similar to what is shown in 2007 SPY chart, the bigger RS in the current SPY chart is interestingly made up by yet a smaller H&S Top pattern (shown in red). 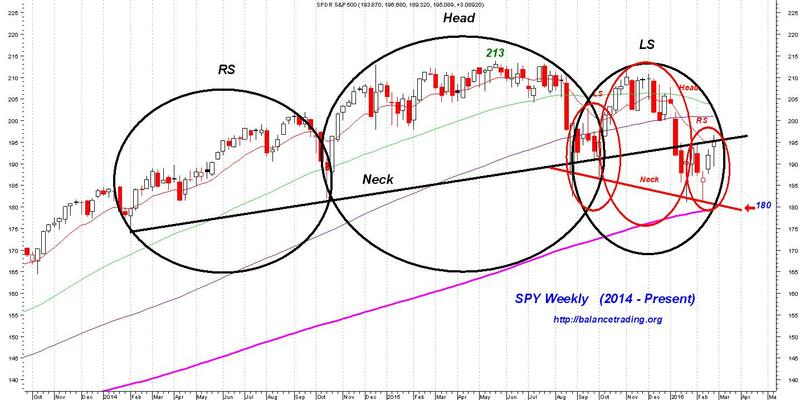 SPY has been trading below the Neck Line of the larger H&S Top since early January. Once SPY closes below the Neck Line of the smaller H&S Top and starts trading below $180, then chances would be excellent that SPY sells off more until the Fed is forced to intervene again. Longer term (weeks to months) picture has not changed much since last week. 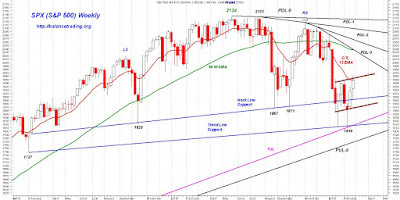 SPX is trading within a bear flag (brown lines shown on chart above). Chances are good that SPX sell off this coming week and falls through the bear flag sometime later in week. 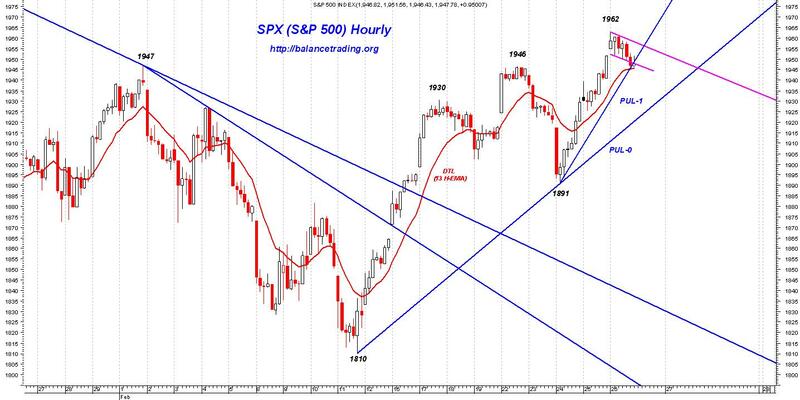 Shorter term, chances are good that the short term bear market rally since SPX 1810 ended on Friday at SPX 1962. No change. Depending what price action is seen around 1830, I might cover all short positions or keep them open. Should SPX sell off, take out 1810 and close below it, I would do my third and final short sell in SPY and QQQ. On Friday 2/19 I opened my first of 10 positions (equal $) in UWTI. My plan is to add to that position on days that WTI Crude is down 4% or more.